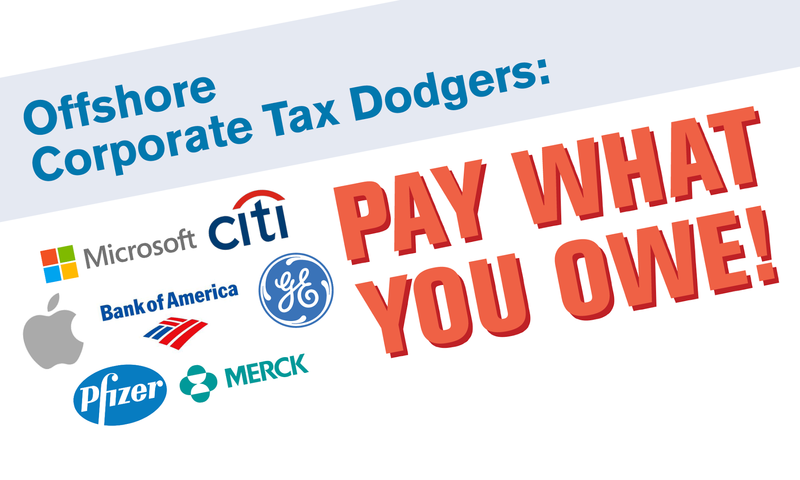 Tax-Dodging Corporations: Pay What You Owe! U.S. corporations have $2.6 TRILLION in profits stashed offshore – most of it in tax havens. As long as those profits are offshore, a tax loophole lets corporations dodge paying taxes on them. It’s time for big corporations to pay about $750 BILLION in taxes that they owe America on those profits. Imagine what we can do with $750 BILLION – create good-paying jobs, improve schools, make college affordable, rebuild crumbling roads and bridges, research new medical cures and more. Congress is considering how much of a tax cut to give these offshore tax dodgers. We say they should pay the $750 billion they owe. We need an economy that works for all of us. If we close tax loopholes for corporations that ship jobs and hide profits offshore, we can raise billions of dollars to invest in America.